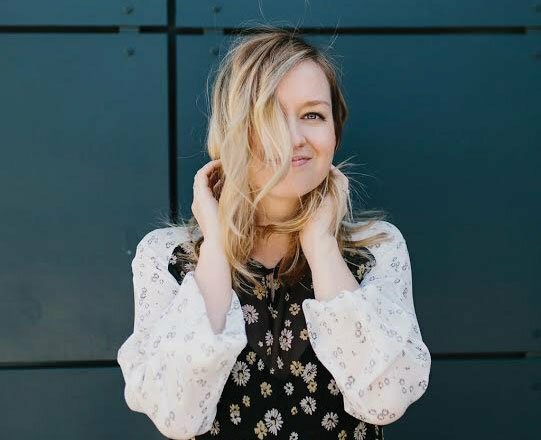 When you think of indulgent comfort food, your mind might immediately think of french fries, mac-n-cheese, or ice cream, but none of those are actually my guilty pleasure. When it comes to my indulgent cravings, give me all the crispy, dripping in sauce, fried chicken wings, please! I can easily eat a dozen, so when I learned that you can make truly crispy wings at home without frying them, I had to try it. I’ve been hooked on them ever since. I can’t take credit for the actual process of making these wings crispy. I found this technique through Cooks Illustrated, which, by the way, is an incredible resource if you’re trying to learn more about cooking. 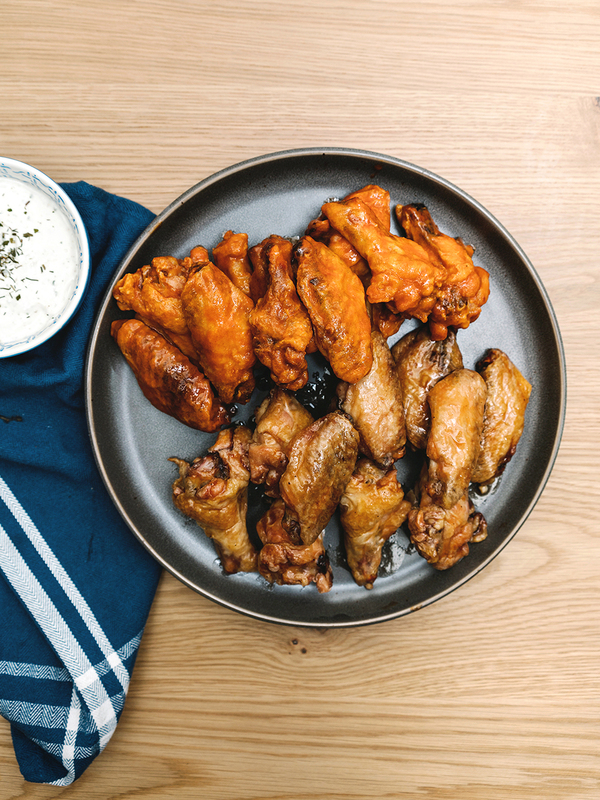 These wings are super easy and perfect for game day, should you fancy yourself the sports-watching-type. The best part? You only need a few ingredients, that you likely have in your pantry to make the perfect homemade crispy wing. The most important ingredient in these wings is BAKING POWDER. Yes, I know, it sounds so strange but it’s the key to pulling out the moisture to get the wings tasting like they are straight from the fryer. 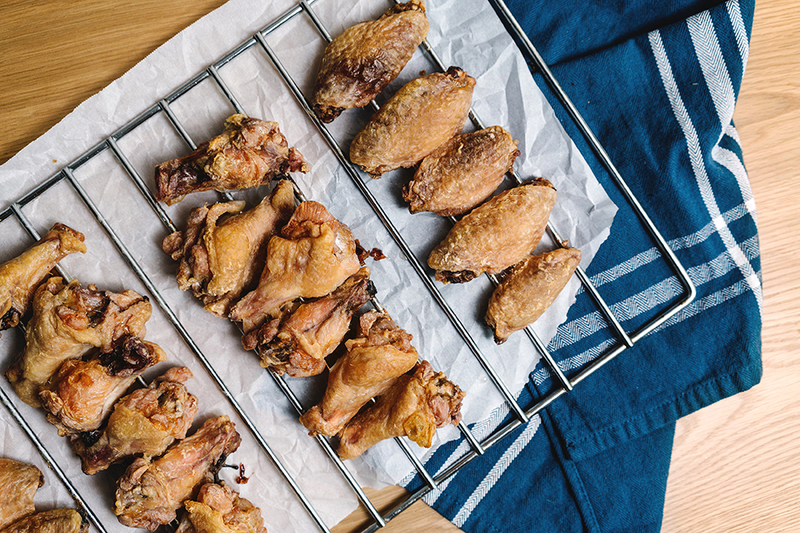 I must emphasize, do NOT use baking soda–this will ruin your wings and your day. Don’t worry, there is no baking powder taste or residue. Once you’ve got your crispy wings cooked, the possibilities are endless! 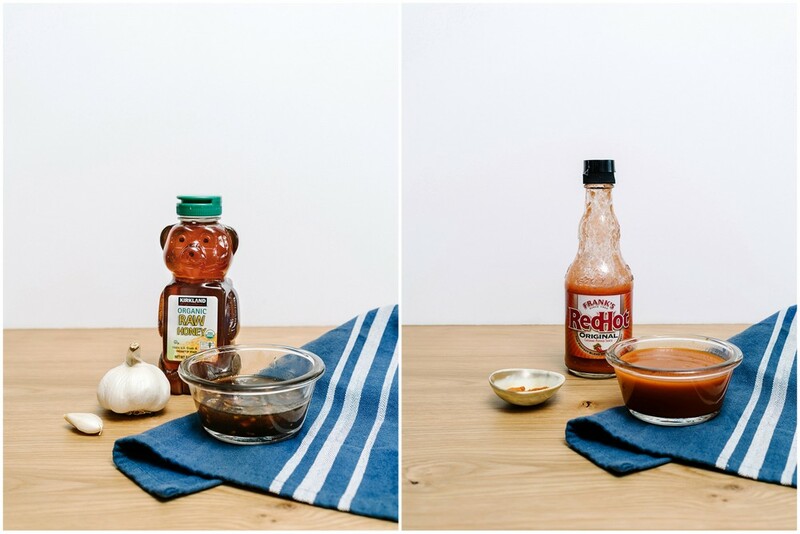 I have included two recipes for my favorite wing sauces to help get you started, but don’t let this post limit you. If you want barbecue sauce, you do you, girl. 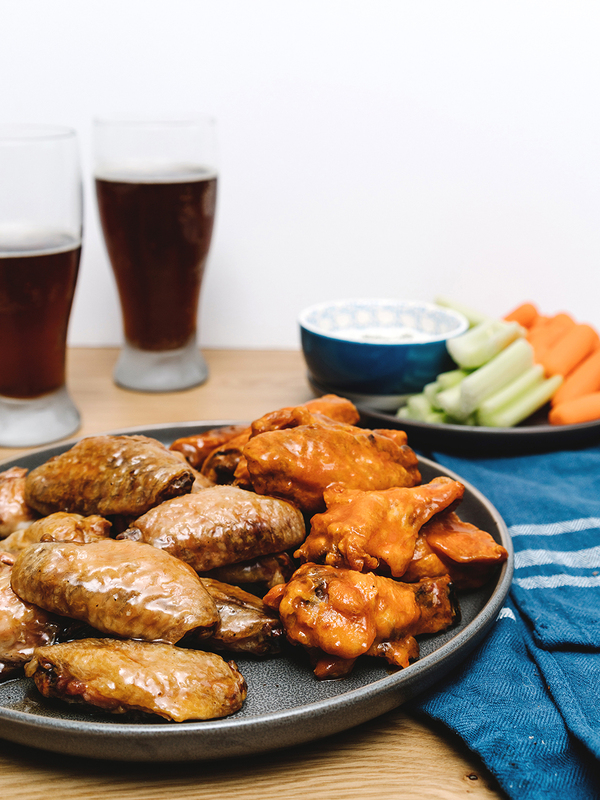 These wings are super easy and perfect for game day (or any day really!). You only need a few ingredients, that you likely have in your pantry to make the perfect homemade crispy wing. Bake at 250F/120C for 30 minutes, then at 425F/220C for 40 – 50 minutes until golden brown and crispy. Set oven to 250 F degrees, adjust oven racks to upper-middle and lower-middle positions. Line a baking tray with parchment (or foil) then place a rack like a cooling rack on top of the tray. Spray the rack with non-stick spray. 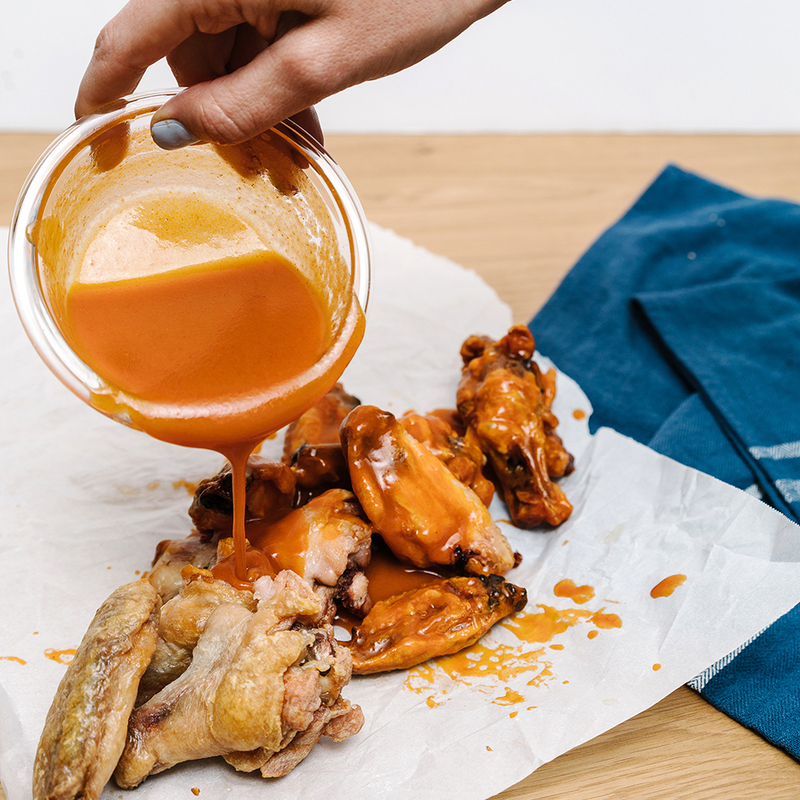 Use a paper towel to pat the wings dry (don’t skip this step, you want your wings dry!). Place wings in a large bowl or in a ziplock bag. Add the baking powder and salt and pepper then toss to coat evenly. Place wings on the lower middle oven rack and bake for 30 minutes at 250. Then, move wings up to the upper middle rack and increase the oven temperature to 425 F, Bake for 40 – 50 minutes. Let sit for 3-5 minutes then toss wings in sauce of choice or serve it on the side. These are best eaten soon after coming from the oven. They are still great after sitting, but they will not be as crispy since the sauce will soak in. 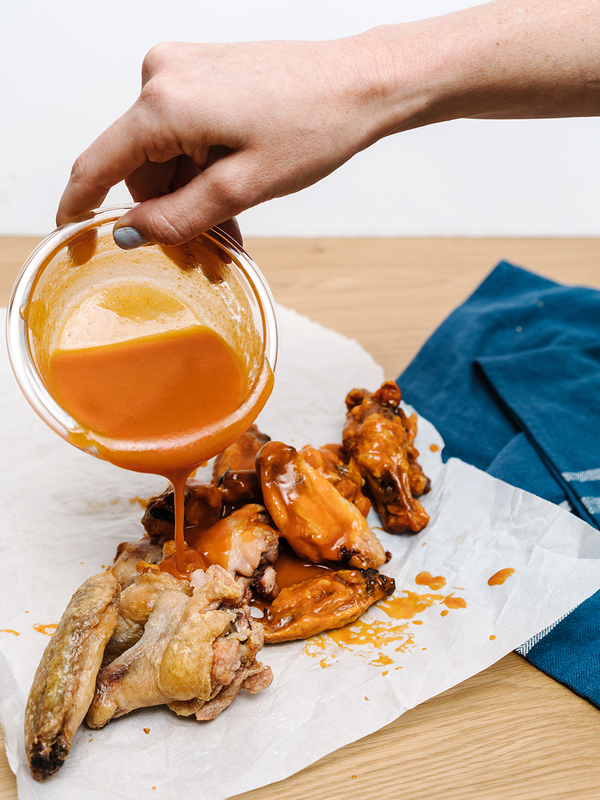 Homemade sauces perfect for pairing with our Crispy GF Baked Wings. Garlic Teriyaki Instructions: Whisk together starch and water. Put honey, aminos, vinegar, garlic and salt/pepper into a sauce pan on med-low, mix well, then add tapioca starch mixture. Cook for 2-3 minutes until thickens. Toss half of the wings in sauce. Buffalo Instructions: In a small saucepan over med-low heat, add all ingredients and stir until well mixed. Toss the remaining wings in sauce. You can leave out the cayenne to give this sauce less heat. Spend Money to Save Time or Spend Time to Save Money? These look so good!!!! Who knew baking powder could make them crispy! Right?! Such a great little secret!